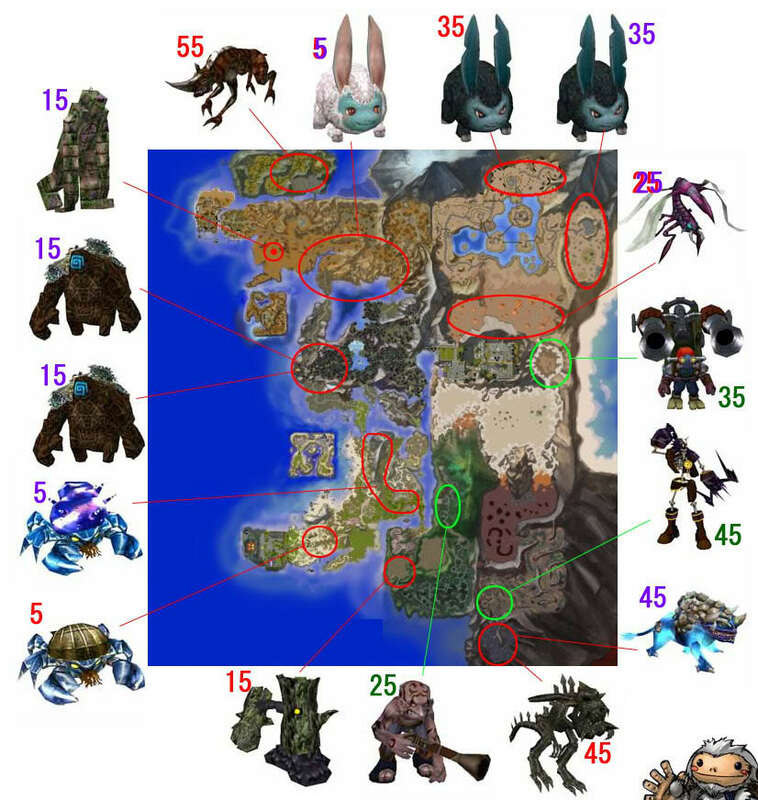 This taming information is based on Fiftynine's guide: Tips On Choosing A Tamed Companion. Taming is a skill of Striders and Wardens. Taming needs no components to cast. You can only tame mobs that have [Calm] at the beginning of the name. There is a 15 minute cooldown after successfully casting the Taming skill. A tamed mob is called a Companion Beast. The Companion Beast only disappears if it dies. There is no timer like a Summon. Companion Boosts cost 100 gold each and can be bought from any Pet Trainer. Each Companion Boost will add 5% to the food gauge of the Tamed monster. If the food gauge of the Companion Beast goes below 80%, the Companion Beast will no longer follow commands. If you die, the Companion Beast will be turned into a Companion Caller and placed in your inventory. Click on the Companion Caller to get your Companion Beast back. You can only have one Companion Beast or Companion Caller at a time. These are identical to the commands used by the Animator or Evoker. Attack - target a mob and order Summon to attack the target. Click on the Companion Caller to summon the Companion Beast again. At Taming level 1 you can Tame a level 5 monster. 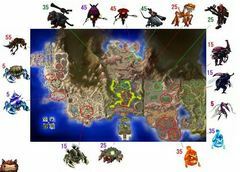 For each additional level in Taming, the monster level increases by 10. If you train Taming to level 3 at level 11, you can Tame up to a level 25 monster. Taming takes a lot of Stamina. Keep some Stamina potions so you can recast Taming immediately after a failure. Attack pets are all about damage. They have low defense and hp so if you set them to aggressive mode and forget about them they're likely to get brutally murdered by anything within 15 levels of them. I recommend these if you're going to be doing the tanking or in a small group of people. I find these to be better in any party situation where you are not fighting a boss. Attack pets will regularly use a charging attack that pierces their target's defense. If they are below 30% hp when they do this it will also stun the target. These pets are excellent meat shields. They have rather high defense and a LOT of HP. They have the lowest attack. They can be left alone for a while on aggressive mode however I personally like leaving them on defense since they'll do all the tanking for me. I do not recommend these if you're fighting monsters that you can kill quickly. These are best suited to monsters that are very close to your own level and can take quite a beating since they'll contribute to the damage and take a few hits off you but if you're fighting something too weak they'll hold you back since you'll be constantly healing them instead of taking the damage yourself and just regening it with your superior health regen. I recommend these when you're fighting large groups of monsters since the added tanking capacity will greatly extend your survivability. When an defense pet attacks it has a very high chance of taunting its target, causing the target to immediately begin attacking it. This can be very useful at lower levels when a defense pet has higher defense than you do. These pets are kind of in the middle ground in terms of stats. They win out by having the same range that you do. I don't have a lot of experience using these since I found them rather hard to keep track of when I did. Since these are best left on aggressive mode and that'll leave them fairly far away from you, it makes them difficult to supervise. There are a lot of people who swear by these as enhancing their survivability. I don't really get it myself. They can be useful. I didn't think there were enough ranged monsters to really make use of their ranged attack if you're not manually ordering them to attack. I suppose if you like manually commanding your pet to attack these would be the best option. These are also the best option for if you are fighting any kind of boss as you will not have to worry about healing them since they won't be taking damage from direct attacks or AoE. Ranged pets have a chance of slowing a target's movement speed when they attack. This is useful if you're kiting something since it won't be able to catch you. NOTE: The L15 Calm Mossy Statue is an Attack/Defense hybrid with an attack of 129 and a Defense of 85. Not sure if it lowers defense/stuns or taunts. 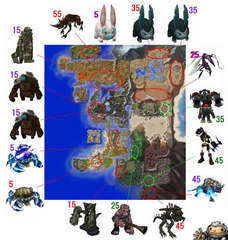 The raw stats are so high on the level 95 tames that there is a tremendous damage increase over the level 85 tames. Easily over 600 damage. While their HP and the rest of their stats improve at a similar rate to previously their STR, CON and INT make a very noticeable leap of 50+ points in each category. STR actually improves by almost 80. This means that they're critting nearly all the time. Monsters will actually miss them on occasion and they are hitting like trucks compared to their level 85 counterparts. To further this new development there is evidence: The level 85 ranged pet hits for 415 damage with a critical hit on a level 80 monster, the level 95 ranged pet hits for 1040 with a critical against the exact same monster. Click on the maps to view maps at full-size. West corner of "Doomkoth corridor"
east corner of "Doomkoth corridor"
Level 65 and Taming Skill 7 65 Calm Warbot Gunner Ranged Pet Negotiation/Arbitration 42k/36k/? Level 75 and Taming Skill 8 75 Calm Mechanized Pom Defense pet Negotiation/Arbitration 42k/36k/?